A block diagram shows the different sections of a transmitter or receiver. 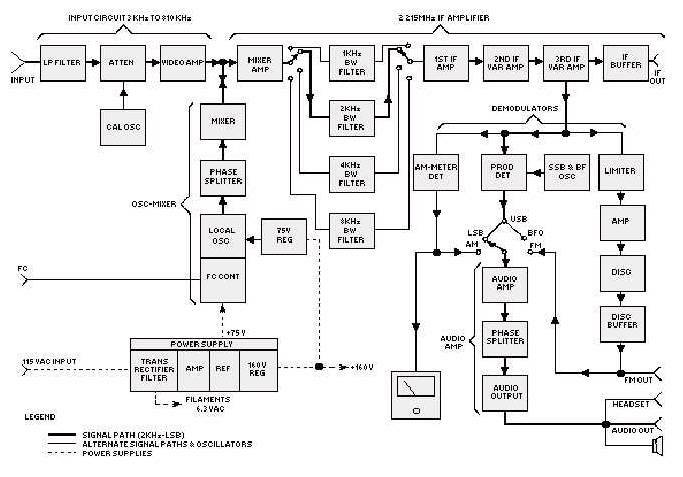 A more detailed schematic diagram shows all of the individual electrical components used to build the radio. For more information on schematic diagrams and electronic components, you might wish to explore Electronics Merit Badge. Transmitters generate "Radio Frequency" (RF) energy. This RF energy is then modified to convey useful information. The simplest method to send information is to turn the transmitter on and off in recognizable pattern, such as Morse code. This has the advantage of being simple radios to build, and is very efficient in using both electrical power and "bandwidth". The disadvantage is the both the person transmitting and receiving the signal need to know Morse Code. Morse Code transmissions are often called "CW" for "Continuous Wave" which describes how the underlying signal is now generated. But how can you send the sound of someone's voice over radio so that an untrained person can hear it? The first technique to be developed is called "Amplitude Modulation" or AM. In this case, the strength of the RF signaled is varied by the sound of the voice being placed on it. While simple to do, this requires a bit of power, occupies a bit of bandwidth, and is subject to atmospheric noise, which often similarly AM. To reduce, the bandwidth and power needed on the HF bands, voice communications are often done using "Single SIde Band" (SSB), which cuts the transmission in half, and suppresses a lot of the carrier signal. The receiver then adds the carrier back using a "Beat Frequency Oscillator" (BFO) to make the "Donald Duck" sounding signal intelligible. It does require more frequency stability and some skill on the receiving operator, so this is mostly used for point to point communications instead of broadcasting. For a really good high fidelity sounding signal, which is especially important when transmitting music, "Frequency Modulation" (FM) is used. In this case the frequency of the carrier signal is varied by the information, instead of the amplitude. This provides a very realistic sound, but since it takes lots of power and bandwidth, is restricted to the VHF and higher portions of the spectrum. A more modern techniques is digital transmission. In this case, the audio signal of a voice is sliced up, sampled, measured, and converted to a numerical value for each millisecond. This data is then sent by microchip computer on the RF as a series of on off pulses, much like an extremely fast Morse Code. The receiving radio's microchip decodes the pattern and numbers to recreate the voice signal in it's speaker. This has the advantage of being less prone to interference as error-correction can be included, and also that computer data can also be sent by radio from one computer to another. Cellular telephones are radios. They transmit radio signals back and forth to a cell site to make phone calls, send text messages, or data for applications. As you change location, the your radio is transferred to another cell site along your way of travel. For the system to work, the cell sites are connected by landline cables. This makes them vulnerable in disasters, as the these landlines can fail and power can be lost. .